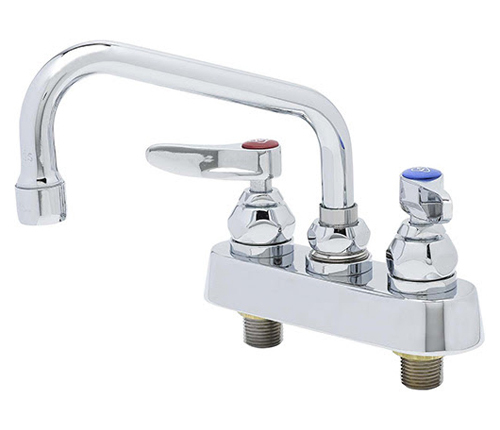 T&S Brass has been manufacturing foodservice plumbing equipment since 1947, starting with a pre-rinse unit. From there, T&S expanded with a full line of plumbing products for the foodservice industry. From faucets and fittings, to specialty items like electronic sensors and vandal-proof aerators, T&S Brass continually innovates and produces products that have become the standard used by schools, restaurants, hospitals, and other public facilities. For every plumbing aspect of your foodservice business, consider T&S Brass. The T&S Brass B-1100 Faucet Series has been modified and enhanced with new technologies and features. With a sleek new appearance on the outside, what really makes the B-1100 workboard faucets new is the heavy-duty forged brass body that now accepts standard T&S Brass compression and ceramic cartridges instead of using a spindle assembly. First, this makes it easier to change out and repair, and reduces the spare parts needed for plumbers to keep in stock. Second, the cartridges eliminate the spindle threads and seats, so there is less wear and tear and the life of the brass faucet body is extended. In addition to the use of cartridges, the T&S Brass B-1100 faucets now have water-conserving 2.2 Gallon Per Minute Aerators instead of stream regulators. So with the new version of these workboard faucets, you are able to be water efficient and save money. Another new feature on this series of faucets is the included, optional swivel-to-rigid lock washers. This means that with one additional lock washer on the nozzle, the installer can choose to make the nozzle either rigid or swivel, increasing the customization of the faucet to better suit the application. Over 150 variations of the redesigned B-1100 series of faucets are available, depending upon the components you select such as different handles or nozzle shapes and lengths. Both deck mount and wall mount models of the B-1100 have been updated. The new streamlined look of the faucet includes both lever handles and wrist-action handles. The new design goes down even to the individual components including the index buttons, the faucet nut bonnet assemblies, packing nuts, and swivel nuts. With the new design and its water-conserving features available in such as great variety of models, nearly any application would benefit from the use of a T&S Brass B-1100. From bar sinks and handwashing sinks to blender stations, if you need a workboard style faucet, consider upgrading to one of the B-1100 series faucets from T&S Brass.